and I live on the far south coast of Australia. you may go and visit. side coming out in me here! My studio is not large but it contains almost everything I need to create with. to feed my heart and soul. The view below is from the door as you enter my room. I think every conceivable shelf and work surface has been occupied to the max. tools and reference books at my fingertips. objects d'art that I can give a home. and this one is a South African protea, called "Blushing Bride"
- isn't she so gorgeous! and our rambly old world country garden. tufts of white and pinkish flowers. of my life who died very sadly and suddenly when I was in my teens! dyed from geraniums and rose petals from the garden. and it is Oh so cosy to sit on!!! creatures out in our paddock???). Oh, by the way, that skin is not from one of our goats either!!! a small collection of very old books which I also love. scales, threads and even tools. which can get lost so easily !!! As I was saying, every shelf, nook and cranny is FULL!!! baskets full of doilies and embroidered tray cloths. my beautiful vintage 1920s typewriter in perfect working order. and each drawer contains three separate compartments. with its beautiful brass pull handles? and vintage silver plated spoons. Precious lace bits - much too precious to use! A collection of sari silk ribbons, braids and trims! A basket full of soft fabrics waiting for a new journal! silk velvet and crushed velvets. Some soft chiffons and silks as in baskets below more fabrics. and pretty pink lacey embellishments! An old tin full of all number of doodads! A few more little bottles as objects of inspiration! Almost too good too use I think! gifts and items I just love. A few old frames, war remnant box and some vintage music sheets. which I have recently undertaken. a new project, journal, collage etc. They are inspirations in themselves don't you think? A little collaged card sent recently to a dear friend in need! and fill me with gratitude! love to create and share their he/arts. Your rewards will be great! What a wonderful visit this was! I would love to come over and have a look at all those lovely laces up close. What a fantastic large window and view you have, I know you must spend many happy hours in this room. Thanks for the tour and all those photos! Oh my goodness I am in Love!! 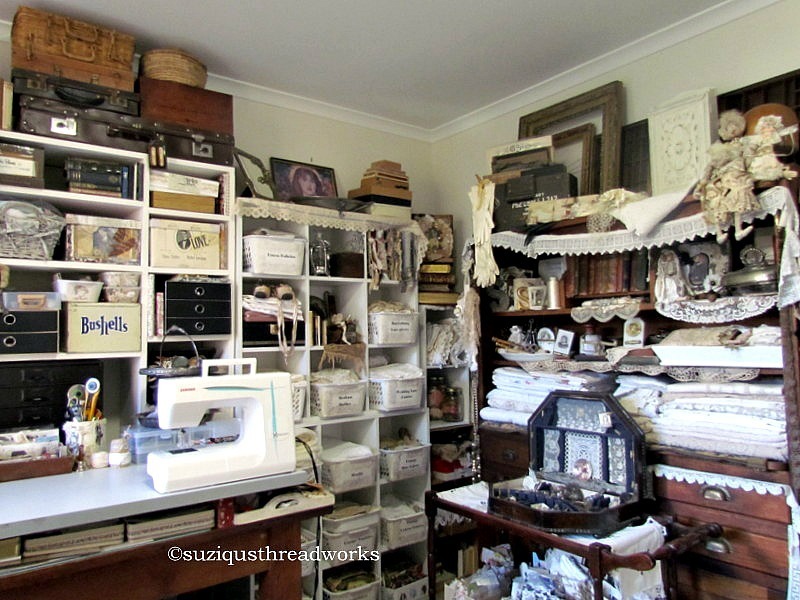 Suzy your craft room is sooooo beautiful! To have the opportunity to come through and visit from across the world is the most precious gift ever! I absolutely love seeing where all your beautiful creations come from. What a treat. I am so excited on the inside that my hands can't keep up with my thoughts for typing what I feel. You will always be my Fabric She-ro!!!! I adore you and all you do!!!! I really enjoyed looking around your studio, it's amazing and I'm so jealous.I going to have a look at some of the others and turn even greener than I already am. What a wonderful studio, Suzy! I wonder why I pictured you in layers of beautiful laces and fabric? lol Your studio is certainly a reflection of your gorgeous creations. I love how everything goes together and replicates my vision of a Victorian boudoir,with layers of lush, rich fabrics, jewels, and laces. You are surrounded by beauty and history. What a lovely setting in which to work, with inspiration everywhere you look! Your studio is beyond beautiful. No wonder you can produce such lovely pieces in such an elegant and interesting surroundings. Thank you so much for the tour .. such eyecandy.. Love it! Oh my goodness, Suzy, what an absolutely wonderful place to create in, dream in, relax in. 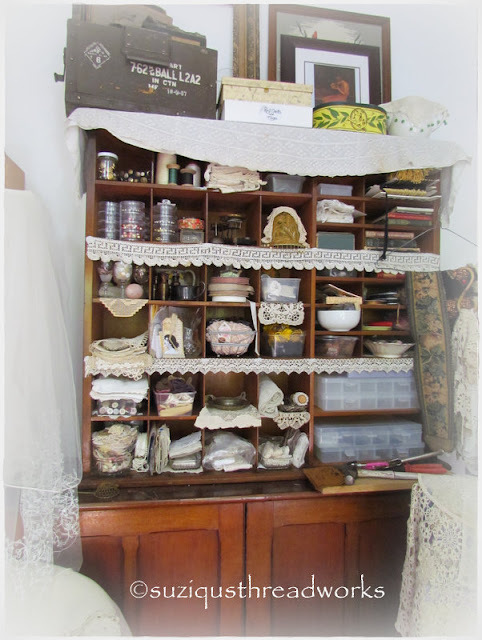 Thank you so much for sharing your very special space with us.It is such a pleasure knowing where the beautiful creations of yours, which I have in my own home, were made and where all the little embellishments and fabric pieces were kept. 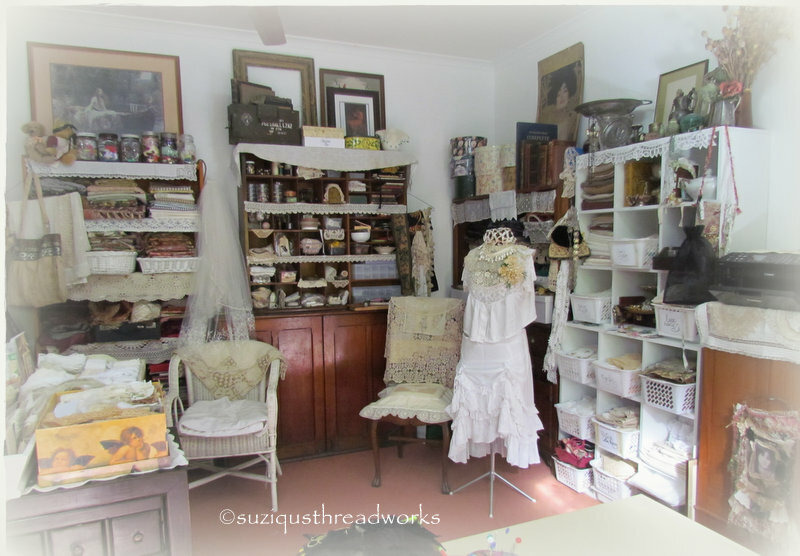 Oh Suzy, I have enjoyed my visit so much, what a delight to have a tour of your wonderful studio. I would love to sit with you and create while looking into your pretty garden. Oh my Goodness!! what a feast!! such a lovely lighted and airy studio you have! i've been sneaking up at other studios and everytime i go green with envy ... becos i only have a 29x29 inch space :( gosh ... what a lovely sanctuary you have. and your antique collection, the typewriter and the Chinese apothecary cupboard ... MAMAMIA!!! What an awesome studio in which to create and full of wonderful treasure at every turn, yum! 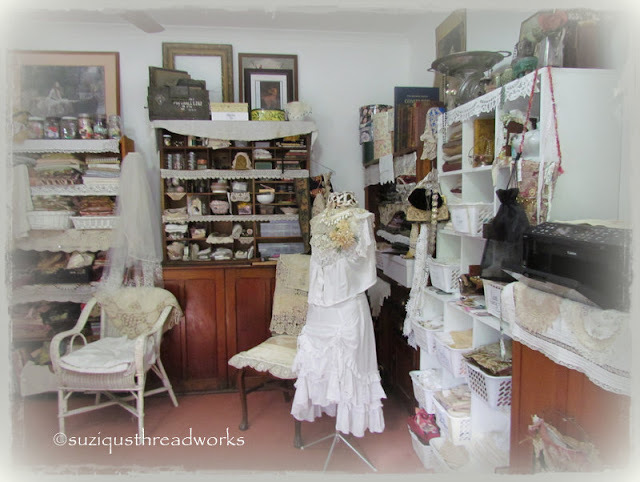 What an absolutely gorgeous, awe-inspiring studio, Suzy - filled with so many beautiful treasures, keepsakes, and inspiration. Wondered where you always find "just the right" embellishment - LOL - now I know - you have a "bit" to choose from, my dear! What a blessing! You did a lot of work providing such amazing photos and they are all wonderful - I will need to go over them a few times. I know it cannot be that organized all the time - thanks so very much for sharing. Hugs and love from Alaska, my friend. WOW, can I come live in your studio? Everything is just gorgeous!!! Thanks for sharing. Oh My Goodness Suzy!! Where do I Start! Your studio reflects just how Creative and Talented you are! What a Perfectly gorgeous Creative Space you have Created for yourself. You must Never want to leave. Thank you for the Little Window into your Creative Spirit! GASP!!! 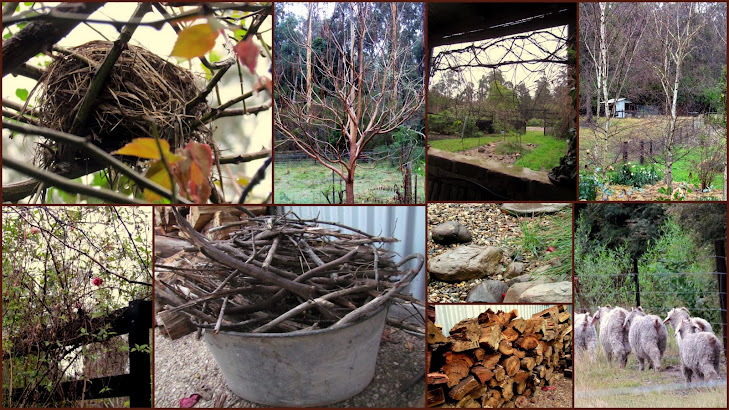 Oh Suzy dear friend -- I knew your place would look like this -- but I had no idea really that anyplace could be so lovely! If I could create a place for you to work your magic - it would be a place just like this. 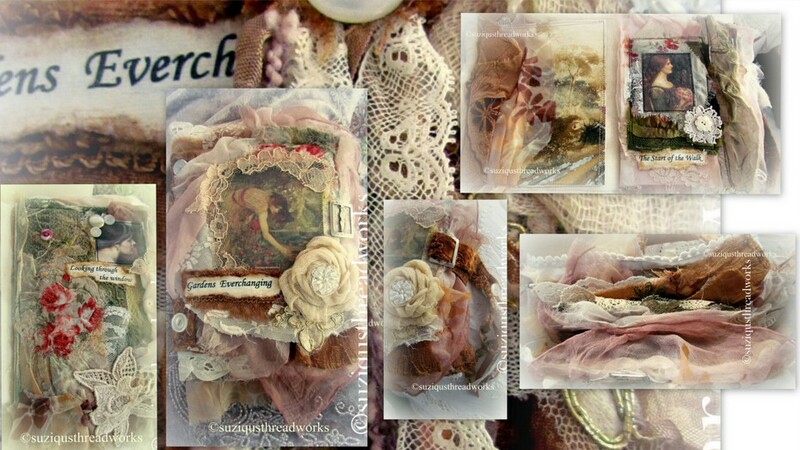 Your treasures - they are so beautifully displayed -- I do not think that I have ever seen such a beautiful collection of vintage laces and notions. Of course you would have these -- there is NO one who makes magic with lace as you do. The photo of your Mother is beautiful beyond words -- I think that you look like her. Did she have the beautiful spirit of creativity as you do? lovely to watch the ground become slowly covered outside those windows. Suzy, it's a good thing I was sitting down because I swear I'm ~swooning~ over your creative space and beautiful treasures! The gypsy in me can't stop poring over each photo- thank you for including so many! This is my first year participating in this wonderful event, so I do hope you'll be able to drop by. Until then, I'm adding your blog to my reader! Oh Suzi! Wow! I am so enthralled with your so very enchanting space! Even just looking out the window is so beautiful, let alone all the gorgeous stacks of luscious fabrics, laces, doilies, and ribbons! Your touches of nostalgia all over are very romantic. Your mother looks beautiful! I am so sorry her journey here was so short. It is dear that she is there with you in the space where you create such beauty. Thank you so much for sharing your very special room with us all. What an incredibly beautiful studio you have. Yours is gorgeous beyond belief. I really like how you store your fabric. It was most inspirational and well worth the price of admission (grin). Hello my dearest Suzy, I'm sitting here with my morning coffee, enjoying the tour of your beautiful studio. It's such a cozy and comfortable place. I wish I could come by and take a closer look at everything in person. I'm in love with that post office dresser. Those cubby holes are so convenient to hold all kinds of great treasures and supplies. 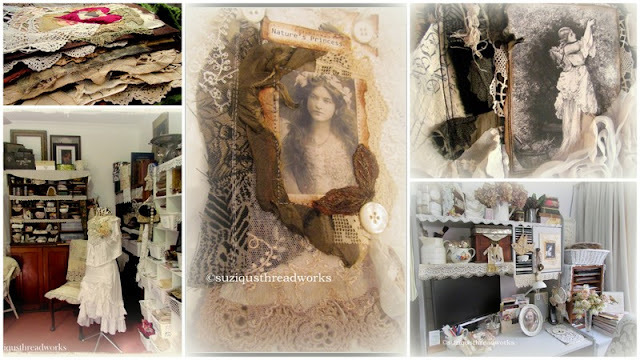 You have such a wonderful selection of fabrics and laces to use in your creations and I loved seeing more of your gorgeous pieces of artwork. The view from your window is very enchanting. Thank you for sharing your dreamy studio with us! What a wonderfull post! The pictures are really beautifull, and I love your studio so full of treasures! When I see this kind of studio, I dream! Oh my gosh!! I don't know where to begin! You have such beautiful treasures and your creations are lovely! Hello my dearest Suzy, and thankyou for inviting me inside your magic world of creativity. Your room is a treasure of beauty and wonderful materials. I so love the postoffice dresser- what a great find.You also have the most wonderful little vignettes all over, the one with the photo of your dear mother and stunning heart, is so beautiful, as is the one inspirering you to the gorgeous Heart String you created. I feel the warmth coming from your sweet soul,watching this room of magic,and love every inch and corner. Thankyou dear for inviting me, I would have LOVED being there for real, studying all the gorgeousnes and amazing creations of your. 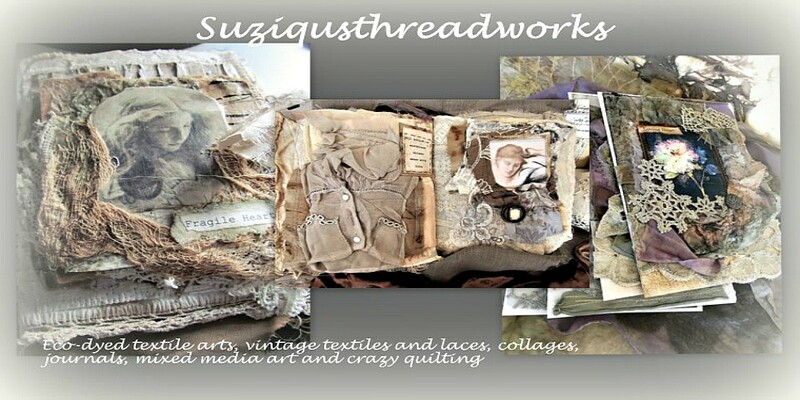 Thank you so much, Suzy, for taking the time to produce all these lovely photos of your studio and your artwork. Everything is fanastic. Such a lovely room to spend your time creating. Congratulations on a job well done. 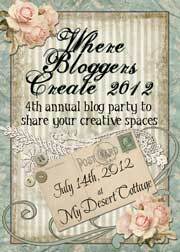 I plan to participate in the 2013 blog party - I'm not ready for photos this year. And Karen is designing my Blogger blog which will be up and running in about a week. I'll make an announcement on the Typepad blog which I'll be closing in August. Love, love, love your style. It's very distinctive. Oh, GOLLY, GOSH, GEE WHIZ! Amazing, charming, inspiring! What a blessing you are to share your beautiful space with us. I love your blog, your art, and today was over the top! Oh... and the photography was wonderful! Best studio tour ever. I am posting it on my facebook page. Dear Suzy what a fantastic and very beautiful place to create in and relax in, so many wonderful thing you are showing, love it all, thanks for the look into your creative world. Wish you a lovely weekend dear friend. Thank you so much for letting us see where you work your magic! I am so intrigued with your distinctive journals and collage creations - they are positively luscious! Viewing them gets my own more modest creative juices flowing. I just don't know how you can bear to disturb your supplies when the array of those is an art in itself. This is what Heaven must look like! I am in awe of your space! I love that you have a sliding door in your space. 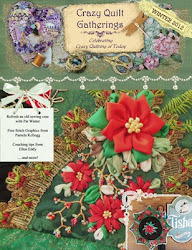 All your gorgeous supplies and projects! I must have spent over an hour just looking! Thanks so much for ALL the eye candy!! WOW---WOW---WOW!!!! I knew it would be amazing, but I didn't know it would be THIS amazing Suzy! I can't believe all the beautiful laces and fabrics. I love that you keep your most precious just to look at also. There are some that I can't bear to use. They are works of art in themselves, aren't they? I was so happy to see more of your artwork and the different things you love to work in. I think having that gorgeous view of the outdoors would keep me in there every chance I would get...in fact, I don't think I would want to be anywhere else, unless it was in your garden. I am so glad that you would share this, because now I think I get more of a sense of where and how you spend your time. Let me ask you---are you a very tidy creator or are you very messy. I am the messy kind and it seems that I spend half of the time just picking up after myself in there. Wonderful creations made in a wonderful studio! 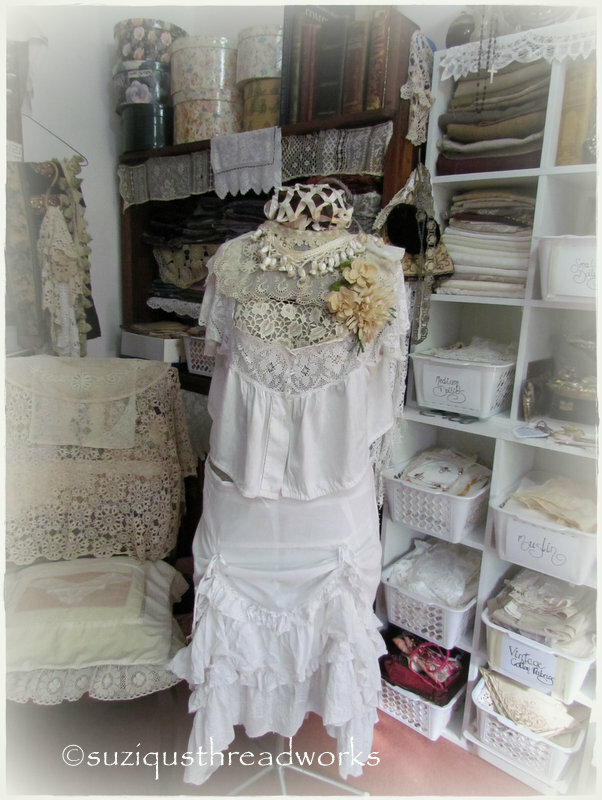 Love all the vintage lace, doilies, silver and antiques you have... a great studio indeed! This place of yors is simply MAGICAL. Devine! And I so wish I could step into it for real and look over all your supplies and art work. Oh Suzy I think I lost my breath breathiung in your studio. It is one of the most marvelous studios I avhe seen. I would never leave!! Of all your nooks and crannies, the post offie dresser is to die for. And your window view. I would love to be there and be allowed to go through all your laces and fabrics and bits and bobs and jsut ooh and ahh all over the place. :) Now I know where to imagine you whenI think of you and when I visit your blog. I love that your eagle eye picked up your bag on my inspiration board. :) I'm so glad we both decided todo this tour this year as it has been a lot of fun. Lovely Suzy - just lovely. You have a wonderful room full of treasures - everywhere you look is another beautiful view! Thanks so much for the tour and seeing all your special supplies in their place - I can see you now, working away, creating your beautiful art! Suzy my creative space wants to be like your space when it grows up!!! 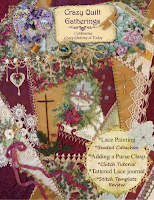 My you have done a lovely job and I love all the gorgeous touches of lace and beauty! Where do I begin? 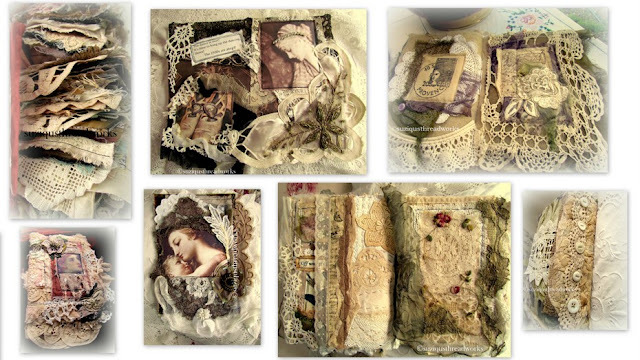 Your work has always inspired me...it is always layered and blissfully romantic. I know that surrounding yourself with all your treasures serves to inspire you to keep on creating! 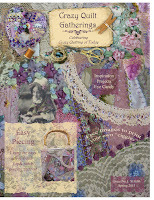 Your gorgeous tapestry bags..and piles of vintage doilies! yummy...! and that gorgeously large window you have to look out of every day....the light alone streaming in must be heaven! and...one last thought...I love that you display your gifted artworks from fellow bloggers...that is perfectly sweet of you! Beautiful work and an amazing studio. Thanks for sharing your inspiration and talent with all of us. Oh my I think I have died and gone to heaven! LOVE IT ALL! Where do I start? Piles of velvet and lace, yum! Your art is amazing, you have a new fan. I am so glad to have found your blog. Thank you for sharing your creative haven! You have a fabulous creative space. I love all your cubbies filled with wonderful lace and supplies to create with. I enjoyed the tour. First I LOVE your fabric journals!!!!! Gorgeous!!! 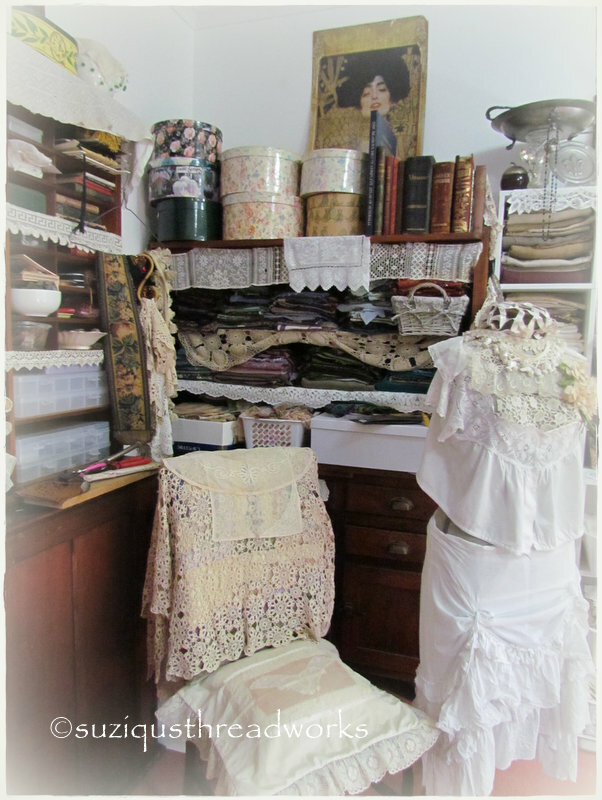 Your room is soo sweet- I love all of your collections of lace and fabric, what a wonderful space to create! Your studio is as beautiful as I imagined it would be! Full of the most gorgeous furniture, finds and fabulous supplies. Thanks so much for sharing! Have a great week. 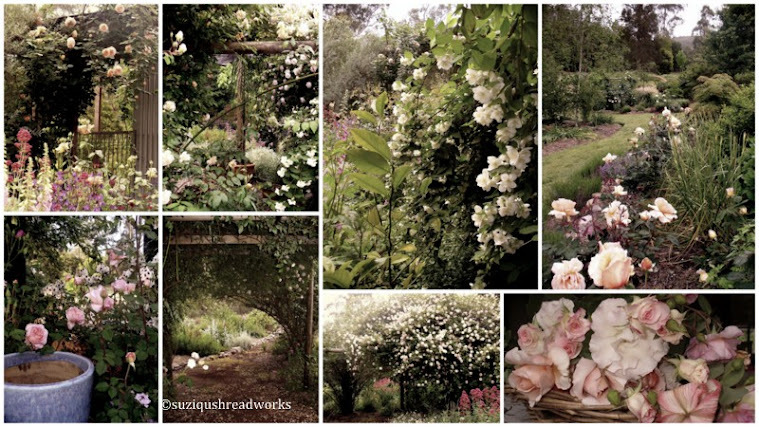 I just love your blog and your gorgeous work piling on all that luscious lace and trim. You are truly gifted. Your studio is wonderful!! I also really like your lambskin seat cover. Wow! Love you creative space!! You have soo many goodies in there! Love all the laces and vintage touches! :) Hope you have a fabulous day! First off, Thanks so much for your visit and kind words! WOW!! I am totally in LOVE with your Creative space! As a fellow lover of lace and fabric, all of yours is to die for! And so much other eye candy abounds here! I love all your beautiful pieces that you have used for storage!! Truly a fantastic space filled with so much inspiration!! Beautiful space, Suzy! I love all those fabrics and trims. Your cubbies are a great storage piece. 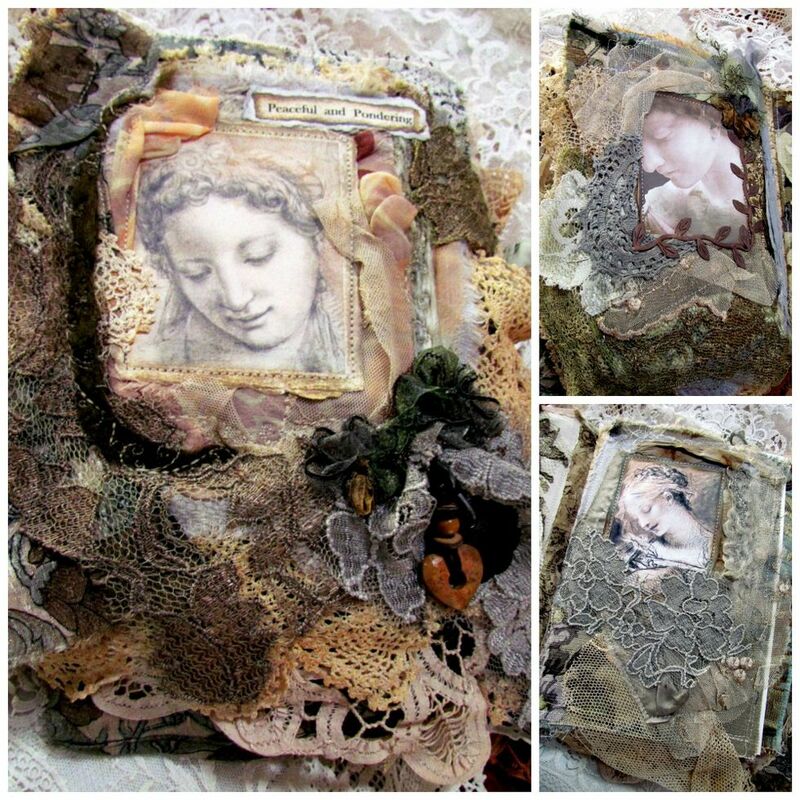 Love your fabric journals and other creations. It must be a lot of fun to pull from all your supplies for the next project. Thanks for sharing your tour! your studio is so very beautiful - thank you so much for the tour:)Have a wonderful week. Goodness, Suzi...that was a remarkable tour! I'm almost on overload with all the treasures you own - and make - and the beautiful ways in which you display them...just glorious! I love your room. You collect many of the same things I do but I do believe you have much more and have displayed it all so beautifully. Thank you for sharing some of your artwork created in your beautiful space. Suzy, what a beautiful studio, and filled with so many beautiful things! Thank you for this wonderful tour and thank you for your kind comment on my WBC party post. Suzy how wonderful. Now I can visualize where you create your wonderful gorgeous things. Hello. Thanks for visiting my blog. How happy I am to have found a fellow Australian creater! I'm from Qld. I love your comment about every space being maxed out! That's how I am too and everything has a place and everything in it's place. It's the only way to keep my sanity. I hate disorder. This WBC party is such fun. It's the 2nd time I've joined. Thanks so much for sharing your lovely lovely creative space. omigosh! What a gorgeous space!! I love love love your vintage pieces and quite covet your post office piece! It's just beautiful! I love that everything is visable, but it's all still organized. And of course, anything old looking I tend to be drawn to anyways:) You just gained another follower (happen to be a bit of a crazy quilter too.) Feel free to take a peek at my blog if you like. Thank you for sharing your beautiful space with us. This visit is a delight from start to finish! I had a pretty good idea that your creative space would be equally as awesome as your creations and I wasn't wrong. Thank you for letting us see! What a wonderful creative area you have. All your materials, fabrics and embellishments are so inspirational to me. Thank you so much Suzy, I look forward to following! Thank you for inviting us into your creative space. I love your postoffice cubbies and I love your handmade journals. Beautiful. Thank your for visiting my blog/studio. WoW! WoW! WoW! Can I come live with you Susie??? Loved the tour and your amazing creations! Suzy, no wonder you create such amazing pieces, you are surrounded by beauty and inspiration at every turn! Your studio is gorgeous and organized so beautifully. I could spend the whole day just looking, inside and out! Lovely! Your studio has all the same loves as mine... the vintage laces and trims (do you stain them?).. the typewriter (downstairs is the typewriter I used when visiting my aunt and uncle)... the suitcase packed and ready to go with laces... then the shot of color with the sari ribbons hanging down... and to top it off ~ your view from your window! I so need to be surrounded with trees! Thanks for sharing your delightful space.. and I forgot to mention your artwork... with all of us! I will be back soon! If you have a moment, I would love to have you drop by my studio and sit down a spell. It looks different from yours but trust me... we are kindred spirits! Oh if you had me over I would be opening every drawer ( with your permission of course...haha) and running my hands on every scrumptious piece. Maybe it's a good thing we live so far apart:) You would never get rid of me. I can't believe you have time to garden too. yicks. I am trying to clean and redo my work room and it's slow going. I mostly want it to look good as I don't really have the time anymore to create much. When I do it's mostly done at work. Oh my gosh Suzy, Your studio is even more beautiful than I ever imagined. Now its all your fault if my computer quits working as I'm drooling all over my keyboard. LOL. Thank you for sharing your lovely studio your vintage goodies and you lovely art! How wonderful! Love those flowers too,,,,,gorgeous! Think they'd grow in Washington State? ummmmm Probably not! Suzy, I have so enjoyed visiting your lovely studio with you today. 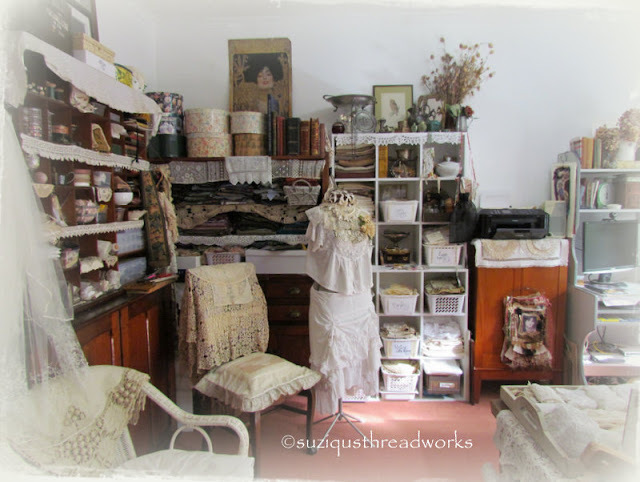 Every photo you shared is a treasure, and I can completely imagine you sitting in such a lacy and feminine room, working at your sewing machine, hand sewing some bit or something, or typing out a little card on your vintage typewriter. You have created a heaven on earth in which to be inspired and to inspire others, and visiting this has been a delight. By the way, I love your blog header. Is that new? So lovely. so beautiful! you are right, we do have very similar tastes in our collections! i love the post office box - that is absolutely perfect! and all your goodies stashed inside of it. just wonderful. your fabric creations are to die for. love your style and how you combine elements. very, very pretty! OMG. My heart is going pitter patter!!! Your studio is fabulous and filled with so many wonderful goodies!! I would be inspired the second I walked in the door! But then, I know you are because you always create the most beautiful fabric creations I have ever seen! Thank you so much for joining the party Suzi!! OH MY GOSH--So this is where all the magic happens? WOW!!! 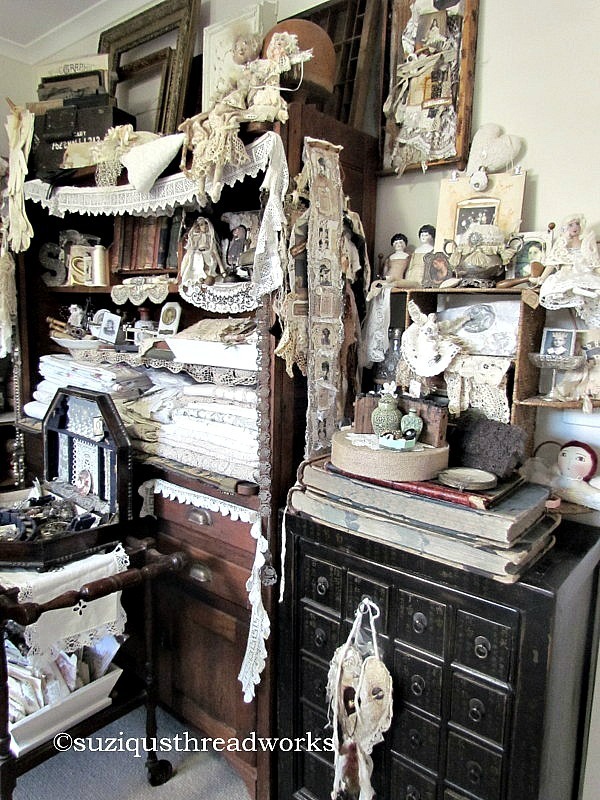 I love it all and of course, adore all the antiques and lace and that typewriter is fantastic, my friend!!! Hi Suzy, I'm back again! lol I just got your new button and exchanged it with the one that was on before--It's beautiful!! And so is your profile pic!!! Wow! 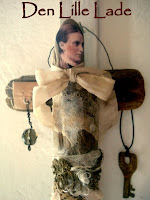 You have an amazing crafting space and you make such truly wonderful things. It has taken me forever to stroll on over and step inside your studio, the wait may have been too long but it was well worth it as I stepped through your door into a place of exquisite beauty. I was so glad you were there to catch me as I did a ladylike swoon onto your studio floor! There is of course the fear that I may never leave your Studio, I may just choose to inhabit a small corner of it for life. Everything is perfection, even in its shabby, distressed form it is still perfection - buttons from days gone by, lace made by hand that has been passed down generations. Your creative haven exudes femininity and beauty, but of course that doesn't surprise us in the least as that is what your artwork represents. Thank you for allowing us this visit and to take in the beauty that beholds us. I so enjoyed my time here and lovely to know I can re-visit at any time. I love all your ribbons lace and trims. Gorgeous. I also love the little clutch purse you showed. Thank you for allowing us to see your wonderful space. I am lucky to be a new follower. I am truly at a loss for words (and trust me THAT never happens with me ;-)! You make the most beautiful items, you have the most beautiful room and all of your collections are absolutely stunning! Even the view out of your window is gorgeous. What a very blessed and lucky lady you are. I will be going back over this post again and again, as it truly fed my soul with each photograph. Thank you so very much for sharing all of this with us. When you have such loveliness, it would be unkind not to share. I am so glad I found your blog through the WBC hop and will be following you from now on! I'd love to be let loose in your studio, the things I could make! Thank you for sharing. Wow! Amazing studio! Amazing work! I too have a wonderful wall of glass to look outside in my studio. I love the piece you made for Karen. Beautiful! Taking some time to visit the great work areas of so many talented people. Love all your special collections and the VIEW!!! WOW I would love to have that much natural light. 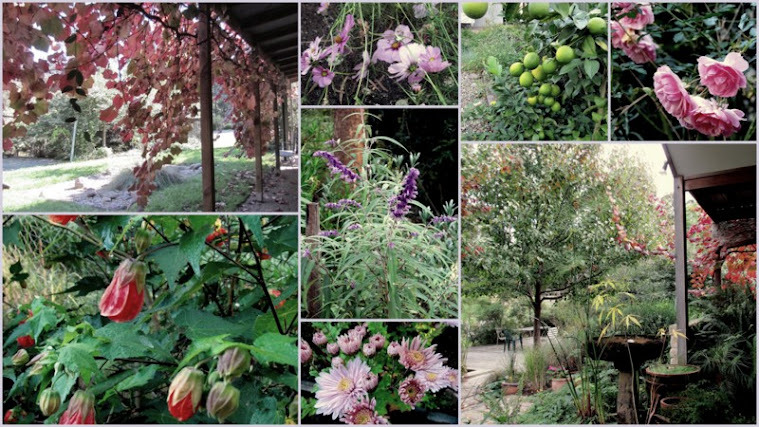 Thanks for sharing all the lovely photos and your special space.